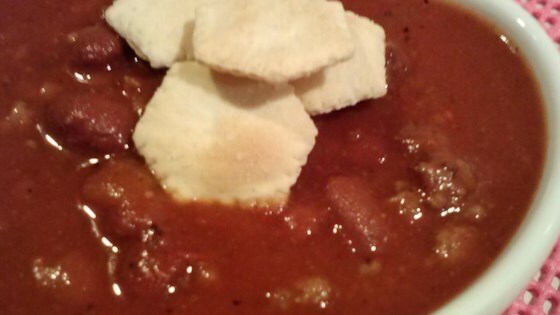 "This is a wonderful chili recipe that I have used to win chili cook-offs in Indiana. It's hearty and spicy award winning chili that is sure to hit the spot on a cold winter's night. The key is in using name brand tomato soup, I have tried it with others but haven't gotten the same results. Your friends will never guess the secret ingredient. Enjoy!" Crumble the ground beef into a soup pot over medium-high heat. Cook and stir until evenly browned. Drain off most of the grease. Add onion, red pepper flakes, and half of the cumin; cook and stir until onion is tender. Pour in the tomato soup, chicken broth, and crushed tomatoes. Season with chili powder, salt and pepper. Simmer for 30 minutes. Pour in the beans, and season with remaining cumin and cayenne pepper; simmer for another 30 minutes. Now enjoy.